Air conditioners are one of the most popular household appliances in the country. Nearly every major electronics brand produces several different models. While the brand of toaster or coffee maker you buy probably will not make much difference, selecting an air conditioner based on brand is actually a smart move. Panasonic Air Conditioners have received top ratings from Canstar Blue, a trusted consumer satisfaction ratings site. What exactly has made Panasonic so popular among Australian air conditioner users? A nation-wide consumer satisfaction poll was conducted. Individual air conditioner owners submitted information about their appliances. When the results were evaluated, the preference was clear. In nearly every category Panasonic air systems came out the clear winner. Panasonic was also granted the five star Most Satisfied Customers 2014 award in the air conditioner category. The 2013/2014 summer saw over 150 high temperature records broken. With dry weather in many locations and long stretches of high temps in Canberra and Adelaide, it is no wonder that approximately two-thirds of survey responders reported that air conditioning was their primary way to stay cool. Half of responders said they used their appliances on a daily basis. Though air conditioner use drops considerably in the winter, one in five surveyed reported weekly appliance operation. 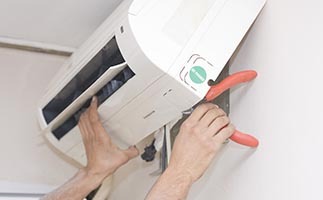 Regular maintenance checks will help ensure that your air conditioner functions reliably all summer long. We perform warranty repairs, parts replacement, and more. Our authorized service technicians are able to repair many top appliance brands, including Panasonic. No matter what brand of air conditioner you depend on to stay cool, we can help. Core Air refrigeration technicians are ready to help households prepare for summer weather. Call us today to schedule a maintenance check; we will make sure your air conditioner is working perfectly.